Dr. Peter Griffin of the Marching Illini re-enacts the legendary band leader's return to Illinois. Illinois alumnus and former Marching Illini director Dr. Peter Griffin ’83, MS ’87, EDD ’04 will conduct the Concert Band of Central Illinois in its annual patriotic concert on June 25, 2011 at Champaign’s historic Virginia Theatre. The program will be broadcast live on WDWS (AM 1400). A podcast will be available following the show at www.wdws.com. The show will celebrate the 100th anniversary of the formation of the U.S. Navy Band at the Great Lakes Naval Training Center. 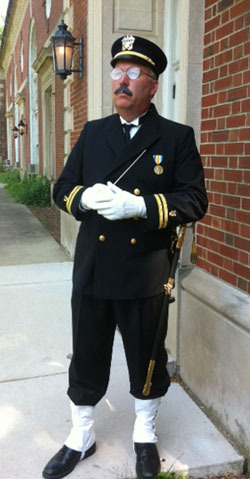 Dr. Griffin will appear as the band’s most famous director, Lieutenant John Philip Sousa who, at the age of 62, volunteered to serve in the Navy at the outbreak of World War I. At the time, Sousa’s civilian band had traveled throughout the United States and the world. Sousa was literally the “rock star” of his era. Independently wealthy, he offered his services to the Navy for one dollar per year. The 90 minute program will feature music the Sousa band played during the 1917-1919 period while Lt. Sousa served in the Navy, including popular music of the time, marches and patriotic selections. The Concert Band of Central Illinois is composed of University of Illinois music faculty, graduate students, area music educators and professional musicians. Professor of tuba Mark E. Moore ’74 and doctoral candidate Aaron Romm MMUS ’10 will perform tuba and cornet solos. Former Alumni Association vice president and retired Navy commander Joe Rank ’69, MS ’73 serves as the historical consultant for the production. He is a saxophonist in the band. After 17 years at Illinois as assistant director and director of the Marching Illini, Dr. Griffin will become the Chairman of the Music Department at Elmhurst College in Elmhurst, IL.